It’s possible to get a mirror finish on your first layer when printing with ABS on kapton tape. Make sure your bed is level and give the kapton tape a quick wipe with ABSynthe; dampen a paper towel with acetone, rub it a few times across a failed print, and then wipe your kapton tape with the residue. Look closely and you can see the little folds left in the print from bumps and bubbles in the kapton. I’ve given up trying to get my kapton to be perfectly smooth, because I have enough things in my life that give me agita. A few little wrinkles aren’t going to make your print fail if your bed’s level and you’ve got an ABSynthe wipe on your kapton. If the bottom of your print looks like this, you might have a little trouble getting it off the build platform. I’ve had my best results giving the side of the print a little tap with a hammer while holding my build platform in place. It helps if the platform’s still warm from the print. This print of a Masonry Bloxen uses Filabot’s recycled ABS at 250°C on a 110° heated bed, on a Replicator1. This entry was posted in 3D Printing, filabot, tinkering and tagged ABSynthe, bloxen, kapton on July 11, 2013 by zheng3. What should my first layer look like? Your 3D printer just arrived. The nearest hackerspace is 100 miles away. You’re all ready to start printing, but all you really know about the technology is what you’ve seen on YouTube videos and breathless reports on Wired, or the Colbert Report. They never show you the bottom of the print in any of those venues. It’s always Stanford bunny this or Colbert head that, and that’s all well and good but there’s no one around to tell you you’re doing it wrong. I was happily printing failbottom models for months before I went to Maker Faire in Detroit and saw a proper print done by some experts. The stringy bottom on the first two prints is mostly caused by having an off-kilter heated build platform. Make sure your heated build platform is as level as possible before you start printing. MakerBot’s leveling script never seems to work perfectly for me, but since I’m printing small objects anyway I just make sure the HBP is locally level in my printing footprint. There’s no need for the corners of the platform to be 100% level if the center’s good enough. I often start a print and let it run for a single layer to let the print heads get to their destination. Then I abort the print, remove any plastic from the HBP, and use ReplicatorG’s homing function to home the Z-axis to minimum. Then it’s a matter of twiddling the thumbscrews on the HBP until the nozzle passes MakerBot’s business card test. When you slide a business card between the nozzle and the HBP and the surface of the card just catches on the nozzle, you’ve got it. It takes some time to get a knack for it, so don’t despair. I find it works best when the nozzle makes an indented scratch along the card’s face. The first company to ship an auto-leveling build platform gets a fistful of cash from me. It’s possible to get a mirror-smooth base when printing on kapton, but I’m mostly printing with ABS on painters’ tape right now. More on that in a subsequent post. This entry was posted in 3D Printing, FAIL, tinkering, troubleshooting and tagged ABS, colbert, detroit, first layer, gaming, kapton, maker faire, MakerBot, ReplicatorG, stanford, technology, wired on February 24, 2013 by zheng3. Kapton tape. Not a good feature. Ok, heads up. I really dig the Makerbot Replicator. Honest I do. I think it’s got great potential, and as a first-of-its-kind consumer level device it’s nothing short of revolutionary. But Kapton tape has to go. If there’s one thing that diminishes the coolness of this device, it’s having to wrestle with a sheet of ill-fitting Kapton. For the uninitiated, the Kapton is the substrate upon which all 3D prints are made. Before one runs a print, you’ve got to cover your heated build platform with a layer of space-age adhesive. It’s clingy, frustrating to work with, expensive, and absolutely essential to getting anything more than a blob of plastic ramen to print. You can print a bunch of times with the same tape, but sooner or later it’ll get ripped, bubbled, or too filthy to use. Take off the tape and go through the painstaking process of getting it fitted to your heated build platform. 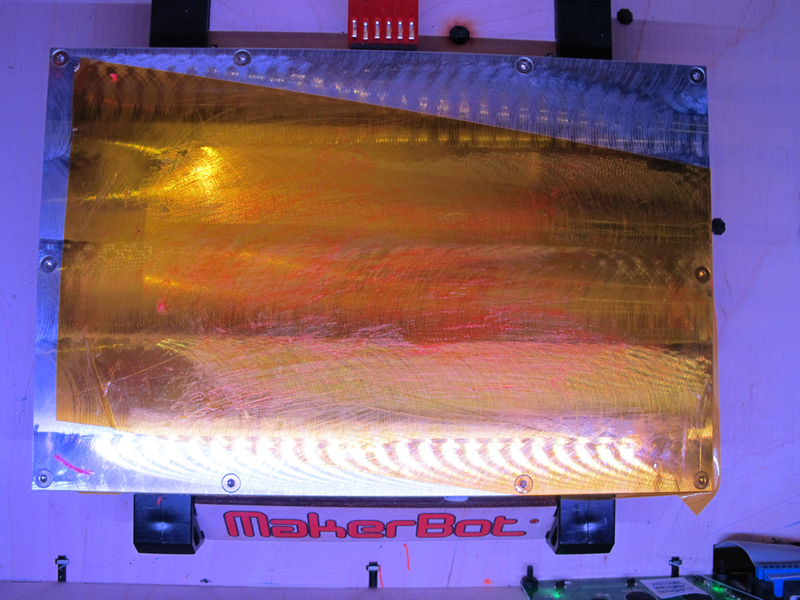 MakerBot Industries, hear my plea: do everything you can to get rid of Kapton tape in version 2.0. This entry was posted in Uncategorized and tagged frustration, kapton, MakerBot, Replicator on May 7, 2012 by zheng3. ABSynthe is a simple brew of filament scraps and acetone. Brush it on your build platform and your ABS prints will be a lot more likely to hold fast for the duration of a print. You’ve probably got some ABS filament ramen or failed prints scattered around your workspace. Chop them up and drop them into a jar of acetone. Feel like Walt from Breaking Bad disposing of the evidence. Don’t overthink it, just add enough acetone to make a thin syrup. Huff not the ABSynthe. I mix my ABSynthe in an (empty) 3.6 ounce jar of Proraso Pre-shave Cream. It’s a convenient size and the plastic top won’t dissolve from the acetone fumes. Plus, it’s imported from Italy. Dip a paper towel in the ABSynthe and smear it across your HBP. Getting ABS prints to stick to a heated build platform can be an art. I’ve had excellent results with some ABS spools, where they melt just enough to stick throughout the duration of a print, but some plastics just don’t like my kapton tape. They end up going for a ride around the platform and I’m left with a big bag of fail. Note that I’ve pretty much given up covering my entire HBP with kapton. I realized I was mostly printing fairly small things, and it didn’t make sense to spend the time ironing out all the bubbles and rending my garments when the kapton bunched up. So I just lay one strip down the center of the HBP and I’m a much more relaxed person now. That schmutz on the kapton is the ABSynthe. I haven’t had a print slip off the platform since I started doing this. I’m generally printing ABS at 120°C. This entry was posted in 3D Printing, tinkering and tagged 3d printing tips, ABS, ABSynthe, breaking bad, kapton, shaving on January 1, 2012 by zheng3.